squash, zucchini, cherry tomatoes, pineapple, etc. In a bowl, toss the shrimp with a little grilling sauce and refrigerate an hour. In a separate bowl, lightly coat the vegetables and fruit with grilling sauce, and refrigerate. Thread the shrimp, vegetables, and fruit onto skewers. You can alternate shrimp and other items, or thread separately. 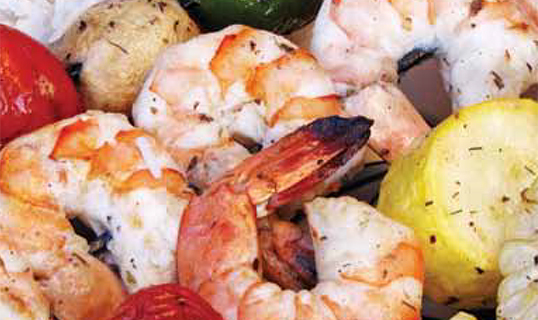 (Shrimp may cook faster than vegetables or fruit.) Place the skewers on a medium-high grill, and turn after four minutes. Baste the skewers with more of the grilling sauce. Cook until the shrimp are pink on the outside and opaque in the center. Remove from heat to a platter. Serve with rice. Use 4 or 5 large shrimp per person. To add fun to your dinner, allow your guests to thread their own skewers!